It was nice to wake up in my own bed for a change! Glad to be home. It was great to get our mail, too. I've been very bad already this week at keeping up on the blog. I spent part of Monday and Tuesday unpacking our luggage. We always take way too many clothes. I hate it if I'm on vacation and I forgot to bring the right clothes. It never fails...if I don't bring enough socks, I will step in a puddle. Same goes for every piece of clothing, really... If I don't bring it, I'll need it. At least I did do the laundry at Susan's house before we left, so I don't have too much laundry to do. 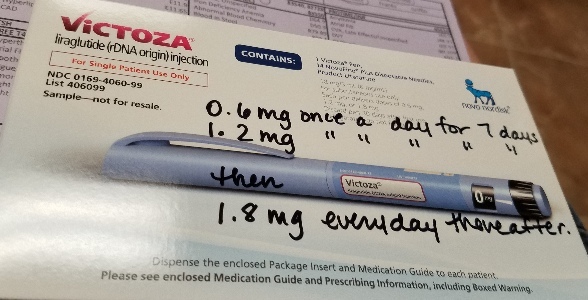 I was going to try to get a doctor's appointment, but instead I just decided to quit taking the Victoza because it makes me too nauseous and brings my blood sugar down too low. At least I did lose 3 lbs. during the vacation! Probably because I wasn't eating much. I wanted to stop going to my old doctor's office, UAMS, because they're just terrible. Three times in the past month I wanted to get an appointment but was told I couldn't get one for at least a week or more. Today they said I couldn't get one until June 26. That's just ridiculous. They have other problems, but that's the latest one that I'm annoyed about. 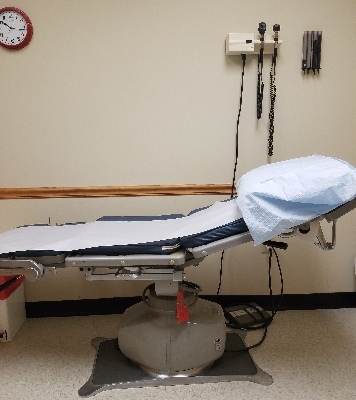 Two weeks ago I put in an application at this other doctor's office, just down the road, and today when I called, I was told the doctor still hadn't even looked at it. Sheesh. I was going to try to get an appointment for Friday or next Tuesday, in case my blood sugar starts going up again. Well, while I was thinking about all this, the nurse for the urgent care doctor I saw last week phoned me and asked if I wanted to come in on Friday! So that was very lucky. It's not a regular urgent care. It's actually a doctor's office and they just have an urgent care as well, for the area. They're called Southern Medical Group. So I will see if I can just see this doctor regularly. She calls herself "Dr. Andy" and she's really nice. She reminds me of the actress who starred in "Profiler," Ally Walker. Also, the pharmacy I use now is in that same building, so it's convenient. Since I stopped taking the Victoza, my blood sugar was a little bit high this morning. Not super high, just higher than it should be for the morning. Tuesday I went to the dentist, and we really didn't get any groceries this weekend, so I just ordered Domino's, which is not good for me. I got a mouth guard, since I grind my teeth. I tried it last night, but I don't know if I will be wearing it. It's too hard to get used to. I probably shouldn't have bothered, since the insurance doesn't cover it and it costs $300. :( You can't return it, either, since it's custom made. I keep trying to buy these shoes from the online store Dr. Comfort. This will be the third time I bought shoes from them. The last pair I bought were 6 1/2 Wide, but I've had to return this new pair twice now and will be doing so again. Even the size 6 was too big. These are orthopedic shoes, so they do have to fit. Facebook keeps reminding me that we left Hawaii a year ago. I know, I know! UGH. I love Hawaii and really miss it, and our friends there. I don't need to be reminded! My SIL Susan is coming to visit next week, so I've been slowly straightening up the place. 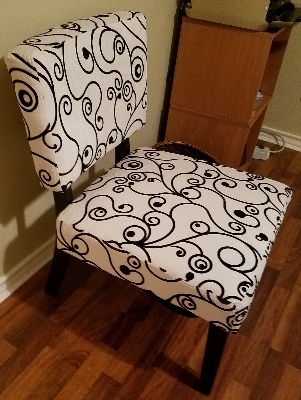 I also got a chair online from Amazon for the guest room, and a rug for the music room. I had already gotten a chair for the music room that I haven't put together yet. At this point, I have about 3 or 4 things to put together, as well as going through some boxes, etc. Friday we're also going shopping for a new bed for the guest bedroom. The place is slowly coming together! I hope we didn't wait too long to buy one and that they can deliver it before she comes on Thursday. We've been seeing this financial advisor, Beth, so one of the things we've been doing is applying for more insurance, etc. A nurse is coming on Monday to give me some tests. They come right to your house. That should be interesting. Hopefully my blood sugar will be under control by then. Then on Wednesday at 8am, Yolanda is coming by to clean the house. Then at 9, LInda is coming by to take me to the grocery store so I can get some last minute plants and things. Today I got some boxes from UPS. One was rather large, and I thought it was the rug I'd ordered for the music room. 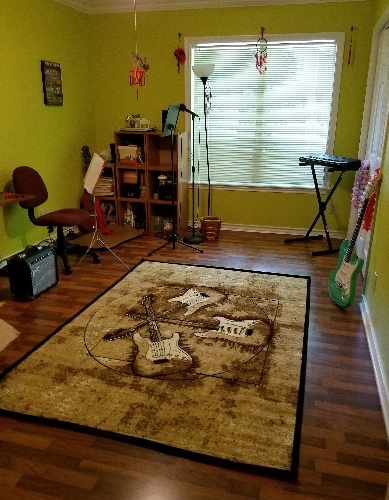 The rug has a guitar print on it. Then when I got it in the room, I saw that it was an actual guitar! I thought that somehow Amazon had messed up, but then I saw by the address that this guy Mark had sent it. I've known Mark a long time. He's an online friend that sings really well. He used to be in a band (might still be, I'm not sure). He has a fantastic singing voice and does heavy metal songs. He's always very encouraging to me about playing the guitar. Anyway, when I emailed him about the guitar, he said that he gets a discount at the store and was giving one to his brother, so he thought I'd like one, too. I had recently recorded some TV shows for him onto a DVD, too. Still, that was super nice of him. Now I have two electric guitars! This one is smaller and might actually be easier for me to use without hurting my back so much. We'll see. I slept in and then was sick quite a lot from gluten, so I slept way too much. I had a lot of weird, post-apocalyptic dreams last night. Not fun. 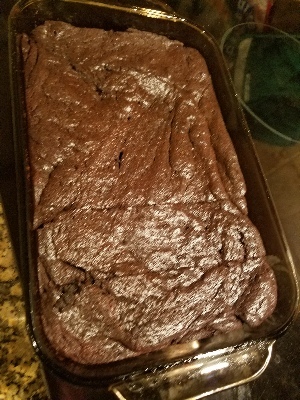 I did the laundry, worked on my site, and made flourless, gluten free, low sugar brownies. I ate way too much today. We went out to Antigua's for dinner. I always get the brisket tacos, which are great. 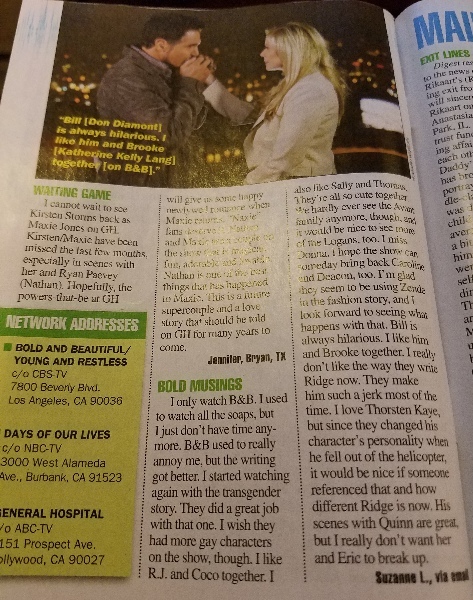 I was reading "Soap Opera Digest" and then discovered that my letter was published (I completely forgot that I sent in a letter). It's always nice to see my writing in print. I had a really hard time sleeping in the evening... slept too much earlier. I got up about 9:15. I was very tired! David took me to my doctor's appointment. The doctor is really nice. 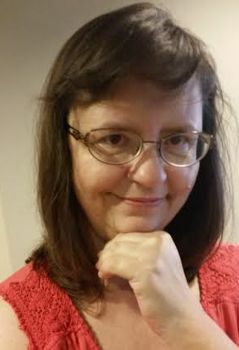 Her name is Andrea Spurling, but everyone calls her "Dr. Andy!" She doubled my metformin and said to try this other drug, but I'm just going to do the first for now and try the other next week if my blood sugar doesn't get low enough. I don't want to be starting a new drug with side effects while we're having company. The nice thing about having a sectional is that I can move pieces of it around. I moved the parts back to where they were before we had company in April, and I turned my computer desk around. It works much better now. My eyes have kind of been bothering me lately...I need to get an appointment with the eye doctor to make sure I don't need new glasses or something. Then we had lunch at McDonald's and also checked out this store, Mac's, which is a grocery store that we'd never been in before. It reminded us a little bit of Piggly Wiggly. It's a discount store, so it has lots of bulk packages, high fat foods, and soggy produce. We'll probably just stick to shopping at Wal-Mart. They actually have pretty good produce here. We had a nap after that, and then a little bit later, we went to the SAU trail and walked around. Stupidly, I forgot to bring my hat. It was very hot, about 98 degrees and really humid. My sunglasses can't handle that. There was almost no shade, either. I took a shower as soon as we got back and I was still sweating for quite a while. UGH. Miserable. At least it was good exercise. I just worked after that, on my laptop, and watched TV. Nothing exciting! I stayed up until about 3am. I ate way too much, and my stomach wasn't feeling well. David woke me up about 11. We went to Flying Burger for lunch. It's usually pretty good. 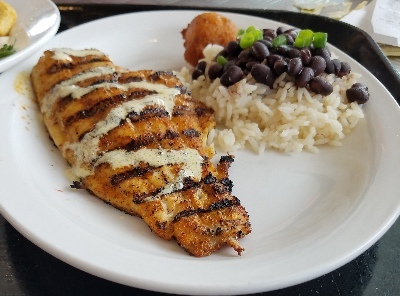 I love their grilled catfish. Then we went to Wal-Mart for groceries. I wasn't feeling too well...the usual problems. I got a few things to spruce up the house before Susan gets here, like a rug for the guest room, some fake flowers and a vase (she's allergic to real ones), some new towels, and some more frames for photos. My right ear has been plugged up all day and hurting a little bit :( I hope it's just allergies! Today it's "only" 93 degrees! LOL! 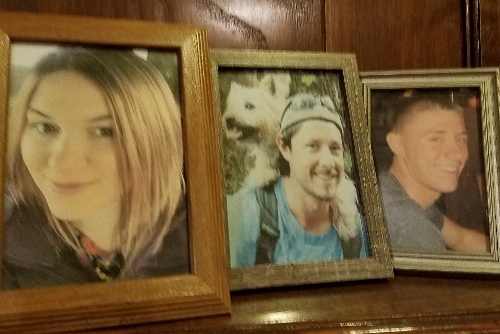 I printed up some new family photos and moved some frames and other hanging pictures around. At least I have one more thing hanging in the guest room. I need something big to put on another wall, but I may not be able to get it in time before Susan visits... they had nothing in Wal-Mart, and I don't really know of any other stores in town that sell art. I had found a couple of prints in the antique store before, but I prefer real paintings if possible. I've been looking online, but real paintings, with frames, are expensive - hundreds of dollars. I did post on a few Facebook groups where people sell stuff locally, to see if anyone has anything, but that's very unlikely. Although at this point, I'd probably take a paint-by-numbers painting if it was pretty enough! LOL! Some of the watercolors on our walls were done by me. I don't really have time this week to make my own, or I probably would. If I had time, I'd take an art class...but my voice lessons went so well this past semester. I would hate to give them up. I don't really have time, with the other classes, to add another class. Maybe one day! We watched some TV and listened to music on the 70's channel... I set up my music room a little bit more. Oh, I put together the two chairs - one for the guest bedroom and one for the music room. The first one was kind of hard because the holes didn't match up quite right. The second one was super easy. I already have the same exact chair in the living room (except that one is blue, and the music room one is red). I also put together this blue magazine rack for the bathroom. It was hardest of all because the holes were not really well-drilled, and I had to screw all of the screws in by hand. I need to get a drill, or an electric screwdriver. The guest room smells funny...might be the rug. I've been airing it out with the fan on, the door open, and an air freshener in there. I can't put in too much scent, though, because Susan will be staying in there and she's very allergic to things like that. Hopefully it will air out and won't smell weird when she visits. I guess if it still smells weird by Tuesday night, I can put some baking soda on there and let it sit, to try to get it out, before vacuuming. I had too much chocolate last night, so my blood sugar was a little high this morning (not surprising). Not TOO high, just a tad higher than it should be. I got a new monitor at the pharmacy, and when I got home and tested with it, it was very high. I compared it to my old one and there was a 40 point difference between them! Wow!! I don't know which one is right now. I have to wait until tomorrow, at least, when I can phone my doctor and get some testing control solution that's not expired... so crazy. Has the old one gone bad, or is the new one not accurately set? Who the heck knows? Geez. The thing is, the manual for the new one says there's a plus or minus 15 points, so it's not within the normal margin of error. I got up around 11. We had lunch at II Brothers, the Italian restaurant. I always get their salad, because it's the only thing there I'm not allergic to. David loves their spaghetti. 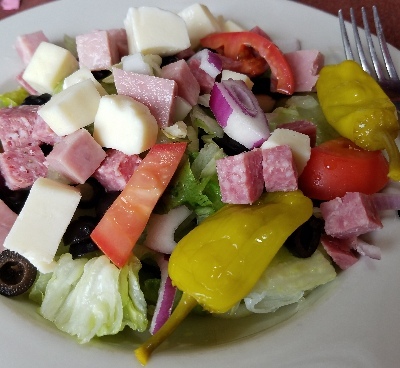 They put lots of meat and cheese on the salad, and olives. I just eat that stuff off the top, with no dressing, and take the rest home for later. Then we stopped at Wal-Mart to pick up my new monitor, and a few other things that we'd forgotten to get the previous day at the grocery store. I mostly just worked all day on my site. I did a few things around the house.... Later, around 7:15, we went for a short walk around the neighborhood. 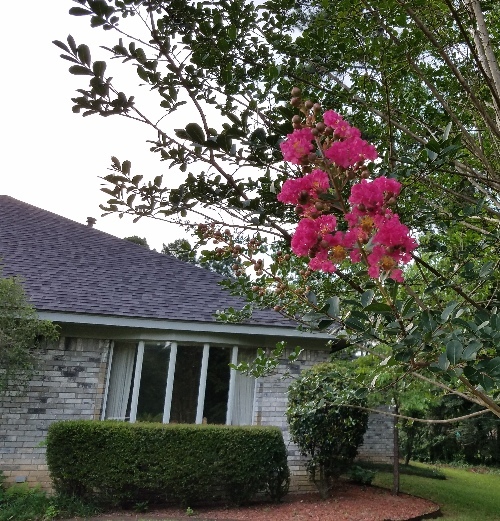 I took my phone and took many photos of the beautiful flowers. 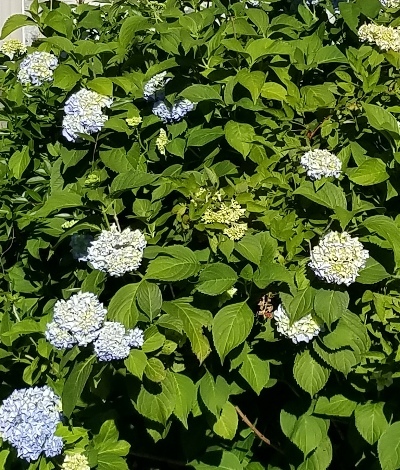 It turns out that the bushes in our backyard, which have these large, beautiful flowers, are hydrangeas (I finally got around to looking them up). They started out white, and then turned yellow, and then blue. They can also be pink. It depends on the acidity in the soil. Fascinating! David's had a little cold. His voice sounds terrible sometimes. He doesn't feel too bad, though. I hope I don't get it. Our allergies are so bad this time of year, that it's hard to tell the difference. We're both sneezing our heads off. I went to bed early, for me, around 11pm. I was so tired! I hope you all had a nice Father's Day!